Float uses a variety of in-house and 3rd-party plugins to provide core and additional functionality. Once you've activated Float, you'll be directed to the Getting started page where you'll see a list of the required and recommended plugins. We recommend that you install all the listed plugins so that you have Float's core functionality available to you. Once you click Begin installing plugins, you'll be directed to the Install Required Plugins page. Select Install from the Bulk Actions dropdown, check all listed plugins and click Apply to begin the automatic installation process. You can also access this page via Appearance > Install Plugins. Once installation is complete, click the Return to Required Plugins Installer link at the bottom of the page. 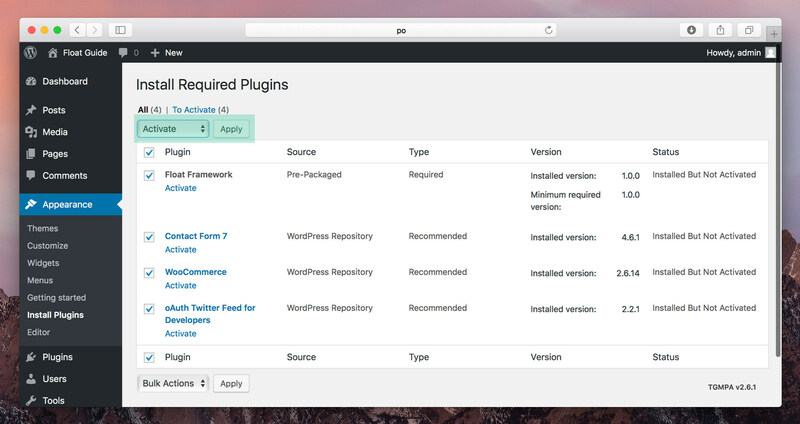 In the Install Required Plugins page, check all the plugins that you've just installed. Select Activate from the Bulk Actions dropdown and click Apply to activate them. We only support our in-house plugins (the pre-packaged Float plugins). 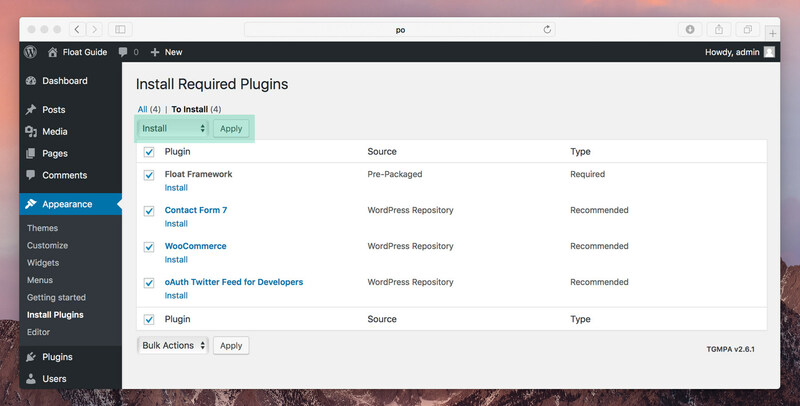 For help with any 3rd party plugins used with Float, including those recommended, you'll need to contact the respective plugin author directly. Float is compatible with a variety of in–house premium add–ons that further extend the functionality of Float. These add–ons include premium shortcodes, wishlists, a portfolio section and more. You can view a full list of Float's add–ons on the Pixelobject website. From version 1.1, Float come bundled with Pixel Shortcodes, Pixel Wishlists and Pixel Portfolio. 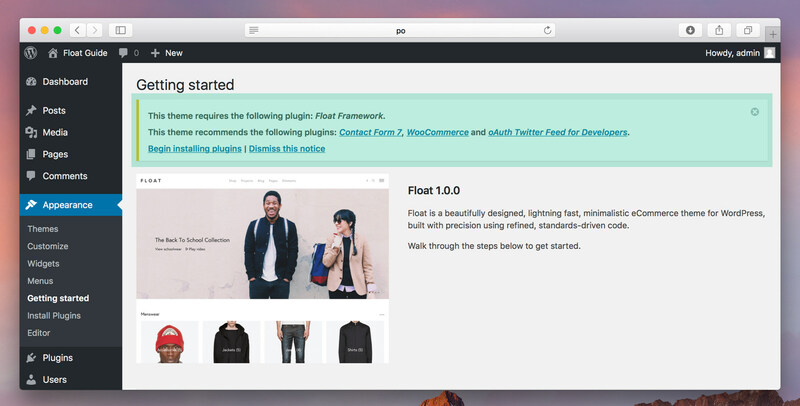 From Float version 1.6.5, Float Framework is now Pixel Framework. If you're using an earlier version of Float and have Float Framework activated, but want to upgrade to Float 1.6.5, first deactivate (not delete) Float Framework. Then, begin the process of installing and activating Pixel Framework as instructed above. If done correctly, all your data will be preserved in Pixel Framework. Once you've checked (and double checked) that all is working fine, you can delete Float Framework from your install. Any issues, please submit a ticket.